Laticrete's Preformed Shower System is designed to eliminate the need for traditional mud bed shower installations. The Pre-Sloped Shower Pan is lightweight, durable, ready to tile right out of the box, and can be used in residential, commercial, and industrial applications. The shower pan is available in several different sizes and can be trimmed down with a utility knife or circular saw if it is a little too large, or if it is not quite big enough, deck mud can be used to fill in the extra space. To complete the shower installation, Laticrete has a full line of preformed shower components including niches, benches, and shelves. Just like the pre-sloped shower pan, all of the components come waterproofed and ready to tile. With Laticrete's Preformed Shower System, your next shower installation will be easy, fast, and reliable, saving you time and money. Laticrete Hydro Ban is ideal for a variety of applications that require waterproofing. Laticrete Hydro Ban Preformed Niche is constructed of lightweight high-density expanded polystyrene with a waterproof finish and is ready to tile. Hydro Ban Sheet Membrane is a waterproof sheet membrane that is installed using a substrate appropriate Laticrete thin-set. LATICRETE Hydro Ban Preformed Curb Overlay is made from high-density expanded polystyrene with a liquid waterproof membrane coating. LATICRETE Hydro Ban Preformed Curb Overlay is lightweight and ready-to-tile. Laticrete Hydro Ban Pre-Sloped Ramp 13 1/2" x 60"
There are a few different methods for creating a shower. Traditional shower installations often require either a mud bed installation or a hot mopping process. With a mud or mortar bed installation, deck mud is used to build up a slope for the shower floor. One process creates the sloped shower floor with a single layer of deck mud. The mud bed is then coated with some type of waterproofing membrane before tiling. The other process requires two mud bed layers for the shower floor including a preslope, followed by a liner, and finally, another layer for the top slope. Traditional mud bed installations are messy, time consuming, and can be tricky to get a correct and consistent slope. Hot mopping uses hot asphalt and felt in layers to make a waterproof shower pan. Fiberglass is then embedded in the corners for reinforcement. As can be imagined, hot mopping is a toxic process involving hazardous chemicals and fumes. While this method is still often used in California, particularly in Southern California, many contractors will now opt for a cleaner and easier waterproofing system for doing shower installations. To eliminate the need for traditional mud bed installations or hot mopping, Laticrete expanded the Hydro Ban line to include a complete shower installation system. The Laticrete Preformed Shower line features everything you need to for a rapid and waterproof shower installation. The industry leading shower system features waterproof shower pans and liners, curbs, niches, benches, shelves, and various styles of drains and drain grates. Additionally, Laticrete offers some of the best warranties in the industry including lifetime residential and 25 year commercial installations. 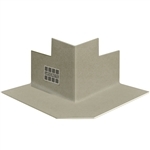 The base component for the Preformed Shower System is the Laticrete Pre-Sloped Shower Pan. The shower pan is made of a lightweight, high-density expanded polystyrene and comes with a correct slope so that a sloped mud bed is not required. Don't let the lightweight design fool you - the shower pan is extremely durable and designed to last a lifetime in residential installations. The shower pans come in a range of sizes so you find the right fit for whatever size your shower is. Additionally, because not all showers are a standard size, the shower pan can be trimmed down with a utility knife if it is too big or if it is a bit small, dry pack can be used to fill in the extra space (both are Laticrete approved methods).